"Plate Charger for Home or Office Décor"
I like creating crafts and home décor items by recycling items or using things I have on hand. Buying craft supplies can be expensive. If you look around your house, you can find things to re-purpose or up-cycle without spending a lot of money. 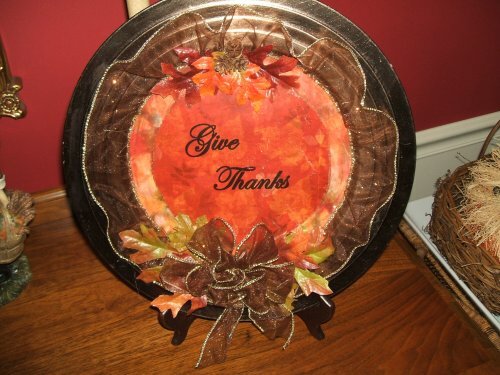 The bronze plate charger was my inspiration for creating this Thanksgiving décor item using items I already had on hand to embellish it. Run scrapbook paper through printer and print “Give Thanks” onto the center of the paper, or handprint the words using a black permanent marker. Cut the paper to fit the inner portion of the charger and use Mod Podge to adhere the paper to the charger. Allow to dry. Measure the diameter of the plate, double the measurement, and cut ribbon to this length. Pull the wire from one side of the ribbon to slightly gather it. Be sure to fold down the wire on the opposite end so that the wire doesn’t pull out of the ribbon. Glue ribbon around center of plate. Decorate with artificial leaves, pinecones, and/or acorns. Tie a bow from the wired ribbon and glue it to the center bottom of the charger. Display on a plate stand.